The Wife is a 2017 drama film directed by Björn Runge and written by Jane Anderson, based on the novel of the same name by Meg Wolitzer. It stars Glenn Close, Jonathan Pryce, and Christian Slater, and follows a woman who questions her life choices as she travels to Stockholm with her husband, who is set to receive the Nobel Prize in Literature. The film premiered on September 12, 2017, at the 2017 Toronto International Film Festival, and was released in the United States on August 17, 2018 by Sony Pictures Classics. It received generally positive reviews from critics, with Close's performance garnering high praise; she won the Golden Globe Award, Screen Actors Guild Award and Critics' Choice Movie Award for Best Actress for her performance, and was nominated for the Academy Award for Best Actress and the BAFTA Award for Best Actress. Although the film's non-linear structure means exposition and revelation is not provided chronologically, a straightforward telling of the plot is as follows. In 1958, Joan Archer meets Joseph Castleman, a handsome young married professor at Smith, a women's college. Although already an accomplished (if unpublished) writer, Joan is awed by Joseph's force of personality and advice that "a writer must write." She meets a published alumna author whose cynical view of the opportunities available to female writers disheartens her. Two years later, Joseph has been fired for having an affair with Joan, his marriage is failing, and his first attempt at writing a novel turns out very poorly. By 1992, an elderly Joseph has become a celebrated author. He wins the Nobel Prize in Literature, about which Joan is less than happy. David, who idolizes his father but is unaware that Joan has written all of Joseph's books, seeks his critique of his first short story. The three of them fly to Stockholm as Nathanial Bone, a biographer with a taste for scandal, tries to ingratiate himself with the Castlemans. Joan's unhappiness worsens as adulation is heaped on Joseph. His attempts to publicly thank her for supporting him only embitter her further. On May 16, 2014, it was reported that Glenn Close would star in an adaptation of the Meg Wolitzer novel The Wife. The film was directed by Björn Runge and written by Jane Anderson. On January 30, 2015, Frances McDormand, Logan Lerman, Brit Marling, Jonathan Pryce, and Christian Slater were announced as having also been cast. On October 19, 2016, Pryce and Slater's involvement was confirmed, and Elizabeth McGovern, Max Irons, and Close's daughter Annie Starke joined the cast, playing the roles originally set with McDormand, Lerman, and Marling, respectively; Harry Lloyd was also added. Close approached Gary Oldman for the part of Joe Castleman but he was unavailable for the role. The Wife shot scenes in Glasgow, Edinburgh, and Arbigland Estate in Dumfries. Glenn Close's performance received widespread critical acclaim and earned her a nomination for the Academy Award for Best Actress. On review aggregator Rotten Tomatoes, the film holds an approval rating of 85% based on 200 reviews, and an average rating of 7.1/10. The website's critical consensus reads, "The Wife relies on the strength of Glenn Close's performance to drive home the power of its story—and she proves thoroughly, grippingly up to the task." On Metacritic, the film has a weighted average score of 77 out of 100, based on 36 critics, indicating "generally favorable reviews." Peter Travers, in Rolling Stone magazine, gave the film four out of five stars, calling Close's acting a "tour-de-force," and saying she "takes it to the next level with a powerfully implosive performance that doubles as an accumulation of details that define a marriage. She never telegraphs Joan’s feelings, letting them unravel slowly as we watch her attend parties as a buildup to the big night." The chief film critic for The Observer Mark Kermode described the movie as a "Stockholm syndrome with a twist," while Glenn Close, interviewed by Robbie Collin for Irish Independent, described it as "part-period piece, part-love story, part-Bergmanesque drama—so much so the latter that it could have been called Scenes from a Marriage." Citing the screening coordinator Peggy Siegal, Bill McCuddy of the Gold Derby called The Wife "the perfect '#MeToo' film" and defined it as Oscar bait. San Diego Reader writer Scott Marks gave the film one out of five stars and criticized the film's simplicity, writing: "It might not have been so bad had the road to the big reveal been paved with insight and originality, but other than the performances, there is nothing here audiences haven't seen more times than they have their own feet." Writing for the Chicago Reader, Ben Sachs wrote: "Because the performances are so calculated, the emotional outbursts on which the story hinges fail to make a dramatic impact. And for a film about a novelist, The Wife conveys very little sense of what it's like to read or write." ^ Wigley, Samuel (September 13, 2017). "British films at Toronto 2017". British Film Institute. Retrieved March 12, 2018. ^ a b "The Wife (2018)". Box Office Mojo. Retrieved February 18, 2019. 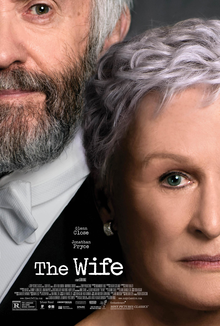 ^ "The Wife (2018) – Financial Infirmation". The Numbers. Retrieved March 3, 2019. ^ Fleming, Mike Jr. (July 25, 2017). "Toronto Film Festival 2017 Unveils Strong Slate". Deadline Hollywood. Penske Business Media. Retrieved July 25, 2017. ^ McNary, Dave (May 16, 2014). "Glenn Close Heading to Sweden to Star in 'The Wife'". Variety. Penske Business Media. Retrieved January 13, 2017. ^ Barraclough, Leo (January 30, 2015). "Berlin: Frances McDormand, Brit Marling, Christian Slater Join 'The Wife'". Variety. Penske Business Media. Retrieved January 13, 2017. ^ Ritman, Alex (October 19, 2016). "Glenn Close's 'The Wife' Rounds Out Cast". The Hollywood Reporter. Prometheus Global Media. Retrieved January 13, 2017. ^ Barnes, Luke (November 21, 2016). "Hollywood superstar Glenn Close spotted in Glasgow as she shoots scenes for movie 'The Wife'". Daily Record. Scottish Daily Record and Sunday Mail. Retrieved January 13, 2017. ^ Swarbrick, Susan (February 15, 2017). "Coming attractions: the star-studded new films and TV shows shot in Scotland". The Herald. Herald & Times Group. Retrieved March 31, 2017. ^ D'Alessandro, Anthony (August 19, 2018). "'Crazy Rich Asians' Even Richer On Saturday With $10M+; Weekend Bling Now At $25M+ With $34M 5-Day Debut". Deadline Hollywood. Penske Business Media. Retrieved August 19, 2018. ^ "The Wife (2018)". Rotten Tomatoes. Fandango Media. Retrieved December 8, 2018. ^ "The Wife Reviews". Metacritic. CBS Interactive. Retrieved November 29, 2018. ^ Travers, Peter (August 14, 2018). "The Wife Review: Glenn Close's Spouse Is Mad as Hell in High-Lit Relationship Drama". Rolling Stone. Retrieved August 19, 2018. ^ Kermode, Mark (September 30, 2018). "The Observer—The New Review—Stockholm syndrome with a twist". The Guardian. Retrieved November 1, 2018. ^ Collin, Robbie (October 7, 2018). "'My childhood gave me a kind of PTSD'—Glenn Close". Irish Independent. Retrieved November 1, 2018. ^ McCuddy, Bill (July 29, 2018). "Glenn Close scores Oscar buzz for The Wife at private Hamptons screening". Gold Derby. Retrieved November 2, 2018. ^ Marks, Scott. "The Wife". San Diego Reader. Retrieved December 8, 2018. ^ Sachs, Ben (August 21, 2018). "The Wife's a better conversation starter than a movie ". Chicago Reader. Retrieved January 29, 2019. ^ "AACTA International Awards: 'Roma' Takes Best Film & Director; 'The Favourite' Also A Double Winner". Deadline Hollywood. January 5, 2019. Retrieved January 6, 2019. ^ Appelo, Tim (January 3, 2019). "2018 Movies for Grownups Awards Nominees". AARP. Archived from the original on January 4, 2019. Retrieved January 3, 2019. ^ "91st Oscars® Nomination Announced" (Press release). Los Angeles, CA: Academy of Motion Picture Arts and Sciences. 22 January 2019. Archived from the original on 23 January 2019. Retrieved 22 January 2019. ^ "2018 EDA Award Nominees". Alliance of Women Film Journalists. December 18, 2018. Retrieved December 20, 2018. ^ "'The Favourite' Dominates BAFTA Nominations 2019". The Hollywood Reporter. January 9, 2019. Archived from the original on January 9, 2019. Retrieved January 9, 2019. ^ "Award Winners 2018". Capri World. January 2, 2019. Retrieved February 4, 2019. ^ "Awards 2018". COFCA. January 4, 2019. Retrieved January 6, 2019. ^ Johnson, Zach (December 10, 2018). "Critics' Choice Awards 2019: The Complete List of Nominations". E!. Retrieved December 10, 2018. ^ French, Alan (December 17, 2018). "Dallas Fort Worth Critics Association Winners – 'A Star Is Born' Finally Grabs Gold". Awards Circuit. Retrieved December 19, 2018. ^ "2018 Awards". IMDb. February 4, 2019. Retrieved February 4, 2019. ^ "'THE FAVOURITE' LEADS 2018 FLORIDA FILM CRITICS AWARDS NOMINATIONS". Florida Film Critics Circle. December 19, 2018. Retrieved December 19, 2018. ^ Mandinach, Zach (October 18, 2018). "Nominations Announced for the 28th Annual IFP Gotham Awards". New York, NY: Independent Filmmaker Project. Archived from the original on October 18, 2018. ^ Staff, THR (December 6, 2018). "Golden Globes Nominations: 'Vice' Leads With 6, 'Versace' Tops TV With 4". The Hollywood Reporter. Retrieved December 6, 2018. ^ "The 22nd Annual 'Hollywood Film Awards®' Marked The Launch Of Awards Season With A Star-Studded Evening". Hollywood, CA: Hollywood Film Awards. November 4, 2018. Archived from the original on November 6, 2018. Retrieved November 4, 2018. ^ Roberts, James (January 4, 2019). "THE FAVOURITE WINS BIG AT 12TH ANNUAL HOUSTON FILM CRITICS SOCIETY AWARDS". Glide Magazine. Retrieved January 6, 2019. ^ "34th Film Independent Spirits Nominations Announced" (PDF). Los Angeles: Independent Spirit Awards. November 15, 2018. Archived (PDF) from the original on November 17, 2018. Retrieved November 17, 2018. ^ "THE FAVOURITE LEADS NOMINEES FOR CC FILM AWARDS". The Critics' Circle. December 18, 2018. Retrieved December 19, 2018. ^ "2018 New Mexico Film Critics Association Awards". Tomates Verdes Fritos de Cine. December 2018. ^ "Glenn Close Icon Award". Palm Springs International Film Society. November 8, 2018. ^ "2018 San Diego Film Critics Society Award Winners". San Diego Film Critics Society. December 10, 2018. Retrieved December 10, 2018. ^ "'A Star Is Born,' 'Roma,' and 'Beale Street' Win Big at the Satellite Awards". Retrieved January 9, 2019. ^ Patrick Hipes (December 12, 2018). "SAG Awards Nominations: 'A Star Is Born', 'Mrs. Maisel', 'Ozark' Lead Way – The Full List". Deadline. ^ "2018 StLFCA Annual Award Nominations". Retrieved December 19, 2018. ^ "The 2018 WAFCA Awards". Washington D.C. Area Film Critics Association. December 3, 2018. Archived from the original on December 3, 2018. Retrieved December 8, 2018. ^ "The 2018 Women Film Critics Circle (WFCC) Winners". Next Best Picture. December 11, 2018. Retrieved December 22, 2018. ^ "Women's Image Awards nominations: 'Mary Queen of Scots,' 'Little Women' lead". Gold Derby. December 11, 2018. Retrieved December 22, 2018.